There's nothing wrong with my nails! You know, I always thought your toes are too long, just saying. Well Jax - they do need attention. But where to snip? Those are so hard to see where - good luck all. Oh, dear. 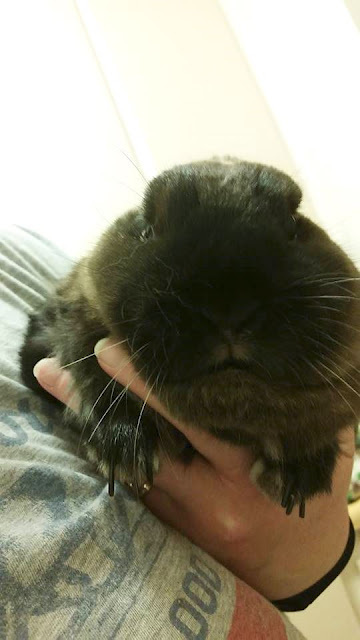 'Glamour' length nails on bunnies are so gauche, Jax. Time for a much needed paw-dicure. Angela, be sure to gear up with approriate PPE (personal protection equipment); looks dangerous! You all, that little bunnbunn is just making conversation, sharing, passing the time of day with Angela. Why is everyone acting like it is some sort of big deal? Next, you are going to be telling Angela to get her affairs in order, and, well, frankly, I just don't get it. Perhaps Jax would approve of some after-clip snacks. His nails grow super long super quick. We always end up toweling him and treats afterwards. Every time! He is well loved, just nails were a lot fierce that day.